The convenient CARESCAPE™ Monitor B450 is robust and flexible enough to meet a patient's changing acuity and care needs, and light enough to travel with the patient throughout your hospital. Just unplug from the bedside and go; the wireless capability allows for continuous patient monitoring and data continuity. Flexible design allows for a multi-parameter module with hemodynamic measurements and one additional single-width measurement module. 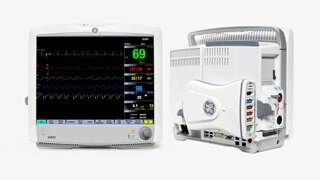 Transportable and affordable, the CARESCAPE Monitor B450 has been designed with emergency departments and surgery centers in mind. The CARESCAPE Monitor B450 gives you uninterrupted patient monitoring and data continuity, wherever your patient goes within the hospital. Access the data you need quickly and easily – even during intra-hospital transport. Configure alarm systems to match your needs. Seamless physiologic data access can help enable fast treatment decisions. Consistent, innovative algorithms aid in accurate diagnoses. 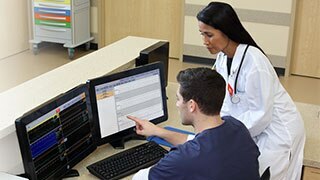 Increase workflow efficiency by configuring the monitor to meet unit standards and patient populations. Improve patient flow and mobility door-to-door while receiving the seamless data flow through the CARESCAPE Gateway into the HIS/EMR. Connect smoothly to displays, printers, recording devices and other bedside monitors for bed-to-bed viewing. This scalable system grows with your needs. Leverage your existing network and protect your long-term investment with scalability, flexibility and upgradability. Easily train all staff experience levels with the user-friendly common interface of the CARESCAPE monitors. Choose options for software, hardware, secondary displays and other capabilities for flexibility. 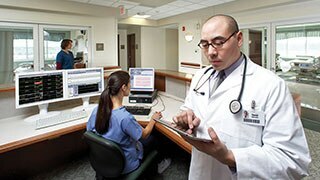 Get dedicated software and parameters for Anesthesia, PACU, Critical Care, Emergency Care and NICU care areas. 1. Not available in all regions. In adults, Entropy monitoring may aid in monitoring the effects of certain anesthetic agents and may be associated with a reduction of anesthetic use and faster emergence from anesthesia. Access to ECG database from pre-op to recovery, to assist in the early detection and treatment of potentially lethal cardiac problems, dysfunctions or disorders. Unity Network™ ID, when combined with the CARESCAPE Monitor B450, allows you to connect to other vendors and selected devices, as well as send data to electronic medical records. Specific NICU software package includes Profiles and Pages, allowing you to reconfigure quickly for patient acuity, type of use or clinical status. Event annotation allows you to differentiate events. Alarm limits are customized for NICU use and can be silenced easily and routed to a network alarm for a more peaceful environment to meet your developmental care goals. Alarm management tools like Automatic View on Alarm and network alarm management help to improve workflow when caring for babies. DINAMAP™ Superstat NIBP algorithm is specially tuned for premature physical characteristics. High-resolution CRG trends with 2-second viewing allow beat-to-beat evaluation of bradycardia and apnea events. Continuous ST-segment monitoring of up to 12 leads and ST trend views help enable you to detect changes almost instantly and follow-up on them immediately. ACI-TIPI facilitates triage of chest pain patients, helping improve diagnostic accuracy and reducing time to treatment. Optional ACS mode provides higher sensivity 12SL™ analysis for the detection of acute coronary syndromes in patients suspected of acute myocardial infarction or ischemia. Up to 72-hour parameter trends allow you to analyze changes in the patient's status, as well as evaluate the treatment's effectiveness. Diagnostic quality of 12SL analysis and automatic, initial interpretation, along with two-way integration to the MUSE™ cardiology information system, enable fast, validated access to a patient's 12SL history and serial comparison of cardiac status. 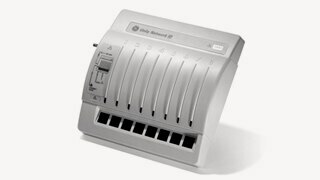 The CARESCAPE Monitor B450 can accommodate one multi-parameter module and one E-Module. CARESCAPE Patient Data Module: Facilitates patient mobility with uninterrupted flow of clinical intelligence before, during and after intra-hospital transport by collecting all patient data from the CARESCAPE modular monitor and refreshing the patient's record when reconnected to the network in the new location. Capable of 24-hour data storage with 36 arrhythmia events, 10 ST segments, 20 cardiac calculations and 10 pulomanary calculations. Exceptional parameter set includes 3-, 5-, and 6-leadwire ECG up to 8 measured ECG waveforms, EK-Pro four-lead arrhythmia analysis, optional 12RL* derived 12-lead ECG and 12SL* diagnostic 12-lead ECG, DINAMAP* SuperSTAT non-invasive blood pressure, and Masimo® SET® or Nellcor® OxiMax® SpO2. 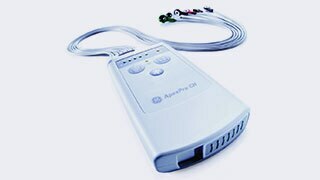 Patient Side Module: Enables simultaneous measurement of 3-, 5-, and 6-leadwire ECG up to 8 measured ECG waveforms, EK-Pro four-lead arrhythmia analysis with ST segment analysis, respiration, pulse oximetry, two temperatures, non-invasive blood pressure and optional two invasive blood pressures (in E-PSMP), optional 12RL* derived 12-lead ECG and 12SL* diagnostic 12-lead ECG in CARESCAPE* modular monitors. E-MASIMO: Oxygen saturation measurement utilizing Masimo SET® pulse oximetry. E-NSATX: Oxygen saturation measurement utilizing Nellcor™ pulse oximetry measurement algorithm, based on OxiMax™ Nell™ line technology. 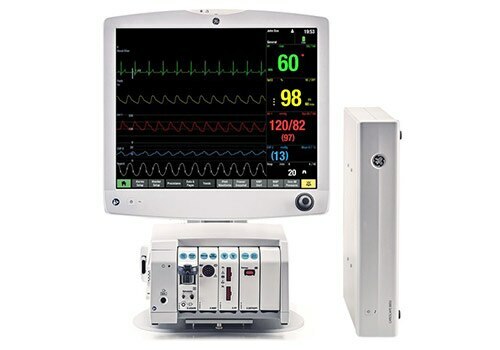 E-PiCCO Module: Provides continuous cardiac output (CCO) measurement based on pulse contour calculation, transpulmonary thermodilution cardiac output (C.O.) and blood pressure (P). E-Entropy Module: Contains GE's unique Entropy* algorithm that monitors the state of the brain during anesthesia. E-NMT Module: Integrates measurement of the level of neuromuscular block and provides a quantitative, automatic measurement of muscle response to an electrical stimulus. GE&apos;s focus on anesthesia delivery innovation is helping clinicians worldwide to deliver tailored therapy to a broad range of patients. Our platform of anesthesia delivery solutions enables clinicians to practice anesthesia delivery, customized to the needs of their patients. Data-driven Alarm Management from GE Healthcare supports improved workflow and reduced fatigue via algorithm excellence, tailored settings and data analytics.